ENNIS HAS BEEN declared Ireland’s cleanest town in the 2017 Anti-Litter League by Irish Business Against Litter (IBAL). Ennis, Roscommon and last year’s winner Kildare were all vying for the title, but the town in County Clare won out. An Taisce surveyed 25 towns and 15 city areas on behalf of IBAL, with 88% of towns surveyed deemed to be as clean as the European average. However, it was a mixed bag for cities, with Tallaght and Limerick City improving but Dublin Centre falling back to moderately littered, and disadvantaged city areas dominating the bottom places in the rankings. An exceptional result for Ennis, which has performed strongly in recent surveys. All approach roads to Ennis got the top litter grade and this high standard was maintained for almost all of the sites surveyed in the town. To mark the achievement, a special public sculpture to the value of €40,000 will be commissioned for Ennis. While it was a good day at the awards for Ennis, there was some bad news for the capital, with the survey showing that litter levels in Dublin city centre are continuing to increase. No town was judged to be a litter blackspot, and only one, Galvone in Limerick, was designated as “seriously littered”. The survey also showed there has been little improvement in several sites previously found to be seriously littered. According to the An Taisce report “this suggests the city councils are not getting to grips with the litter problem in the area”. Castlebar and Portlaoise progressed strongly in the rankings, but Navan and Carlow both fell to “moderately littered”. Despite some areas not showing improvement, some 88% of towns were deemed clean, a slight improvement on the previous year, with 40% judged to be cleaner than the European average. In contrast, city areas occupied six of the bottom seven places in the rankings. Continuing a trend of recent years, litter levels increased in Dublin city centre towards the end of the year. However, Dublin’s north inner city recorded its best ever performance since it was first surveyed in 2011. An Taisce noted an absence of littered blackspots or seriously littered sites in the area. “A starting point on the road to cleanliness is to concentrate on very bad sites and there are signs the council are doing this,” said IBAL’s Conor Horgan. “The council has been successful in keeping our capital clean for the peak summer season, but less so when it is over. Cleanliness is not just for tourists – it should be year-long,” said Horgan. “With Dublin, it can often be the case on one step forward, two steps back,” Horgan told TheJournal.ie, stating that the council must now focus on cleaning up disadvantaged areas of the city. 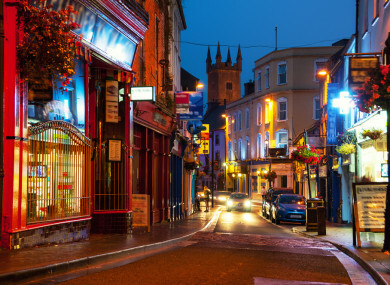 While the main shopping street areas of Henry Street, O’Connell Street and Grafton Street presented particularly well, there were litter blackspots on Mountjoy Street, Hanover Lane and Capel Street. Horgan said surveys, such as this, put pressure on local authorities to act. “So many want to shoot the messenger, but it is tough love for those at the bottom of the pile,” said Horgan, who explained that very few of the towns at the lower end of the table can see there is a problem in the town or area. “They say that we are preventing shoppers and tourists from coming into the area, or that it shows them in a bad light, but it is not about that,” explained Horgan, who added that towns that have shown huge improvements over the years, such as Bray and Tullamore, is because the community put in a big effort. The survey showed progress in cities has been much slower than in towns, and much less consistent. Horgan explained there is an underlying change in the public’s psyche in terms of litter and pollution, which he said brings hope for the future. “In this latest survey, for example, we have seen reversals in recent improvements in Dublin City Centre and Ballymun, as well as in Galway City’s Ballybane and Mahon in Cork, in a way that we have not witnessed in towns,“ explained Horgan. Email “Ennis has been declared Ireland's cleanest town”. Feedback on “Ennis has been declared Ireland's cleanest town”.